In 1H2017, out of the total investment of INR 16,008cr, the top seven real estate markets in India received an investment of more than INR 13,500cr. Among these cities, Delhi-NCR received the highest investment of over INR 5,800cr followed by Mumbai region at over INR 3,100cr and Bengaluru at over INR 2,100cr. 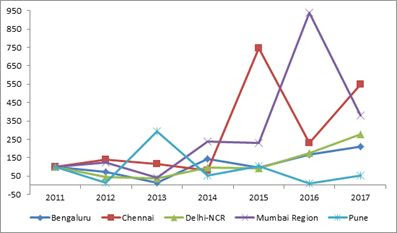 Chennai received almost INR 1,700cr distantly followed by Pune (INR 320cr) and Hyderabad (INR 300cr). While Delhi-NCR has been the worst affected realty market in the country, it received 43% of the total pie thanks to improvement in the investment climate and newer policies leading to more transparency in this sector. Compared to previous 1H’s, this was a record high for the city’s real estate market. Similarly, Bengaluru saw the highest 1H investment compared to all previous first halves. Already, 2017 seems to have set a new milestone as far as investment inflows into the real estate sector are concerned. The total investment (in INR cr) in 1H 2017, which stands at more than INR 16,000cr, is the highest ever seen in any year’s first half. It has not only exceeded the 1H2007 but also 1H2016. Demonetization, big bang policy reforms, economic and political stability, liberalisation of the FDI policy and the resultant improvement in the investment community’s sentiment are some of the factors working in Indian real estate’s favour. Other policies like the GST, RERA, Benami Property Act are already showing positive effects. REITs are expected to launch soon. All this is expected to help the sector evolve into a more mature, consolidated and highly-transparent industry.